On Tuesday 5th and Wednesday 6th March I attended the Ambition UK Emergency Preparedness, Resilience and Response Expo. This ran alongside the Security and Counter Terror Expo, and Forensics Europe Expo as part of UK Security Week, hosted at the Olympia, London. During the expo I represented my co-sponsor company INMM (In Manibus Meis), demonstrating the research currently being undertaken at Loughborough University as part of the CDT-EI, and its link with their commercial offerings. Whilst at the event, I spent time on the companies exhibition stand meeting key stake holders and gaining a deeper insight into the operation of the business. There was a few prominent interested parties the company will be exploring further. Additionally, over the course of the two days there were opportunities to expand my own personal network, and attend a variety of talks by a wide range of interesting speakers as part of the conference programme. The insights gained from this will be extremely beneficial in applying my research outputs, taking into account the current relevant problems within the wider industry. 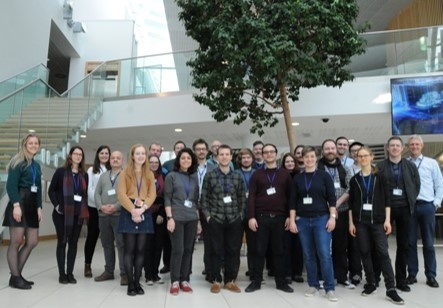 Each year the Ordnance Survey (OS) invites the PhD students it sponsors to its HQ in Southampton for a workshop involving presentations of each student’s current status and work, panel discussion on topics and general networking. 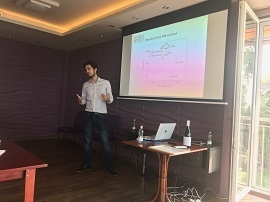 There were 22 PhD students present at the workshop, all from different backgrounds and Universities spanning the UK and even including one person who travelled from New Zealand. Each student had the opportunity to prepare a poster and presentation. My poster focused on the opportunities of my research question and how I was planning to tackle the area, as I don’t have any data yet. My 10-minute presentation echoed this in more detail, giving examples of some of the design methods I want to use and what I have read so far. There was an hour-long poster session on both days which allowed the staff members to come and ask us about our projects. Feedback on my poster was positive. In particular, they found it visually appealing and engaging, however, it perplexed a few as it isn’t what you would expect for a typical PhD poster! I felt quite unique as I am the only researcher with a ‘pure’ design background and the only one focussing on wearables and actual physical prototyping. From the conversations I had the majority of other researchers were focused on data, ontologies and especially deep/machine learning and forms of automation. 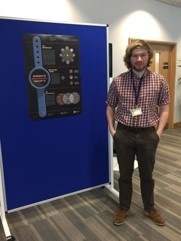 As well as meeting other researchers sponsored by OS I was able to speak with a number of staff members, one person in particular, Tim Newman, expressed an interest in the project as he could see possible applications within the walkers’ community. Wen Gu & Shaun Smith, of Cohort 3 & 4 respectively, recently attended the 2-day Future Powertrain Conference (FPC2018). The FPC2018 invites over 500 delegates from both academia and industry to present innovative research ideas and discuss the future of the industry. 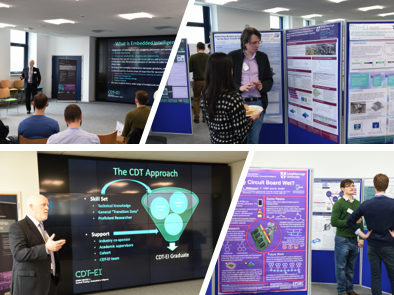 This was the first conference for the students since joining the CDT-EI and the main reasons for attending was to first potentially discover new research topics and secondly anchor their own research by considering where they could add their knowledge to the problems in the industry. In addition, the FPC2018 offered networking sessions throughout both days allowing the valuable opportunity for the students to fully immerse themselves in the sector by speaking to experts in the industry and open the door for possible collaboration. Wen Gu presented a poster at the conference to demonstrate his current research. By implementing the machine learning algorithm, he developed a model learning approach to reflect the engine behavior faster and more accurate. The adaptive model predictive control method is employed to dynamically optimise the engine fuel economy based on the developed time-varying model. This approach is promising in improving fuel economy of powertrain systems and leading the way to next generation low carbon engines. 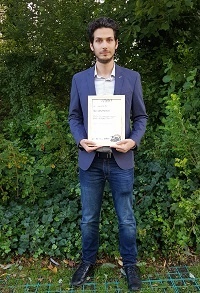 At the end of the conference, he won the third prize of poster competition section. The future powertrain conference returns in 2019 at the National Motorcycle Museum, Solihull, where students will again be attending representing the CDT-EI.